You can find a lot of information in the graphs section. Graphs are handy for keeping track of nearly everything in the game. Sets of graphs can be made to automatically appear at the start of each turn to show information you need. 1. Categories: These are all the categories of graphs available. Click on one of these buttons to display all of the available graphs in that section. 2. Products / Counties: Click the green arrows to switch between the products and counties. This is only displayed in the Products and Land Plots categories. All of the items in each of those sections depends on the currently selected item. 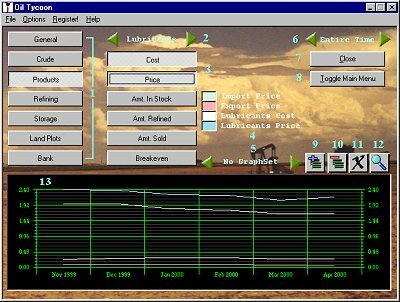 If you are in the Products section, Lubricants is selected, and you click Cost, a graph of the cost of Lubricants will be displayed. 3. Category graphs: This is a list of all of the graphs in the current category. Click on one of these buttons to display the graph. You can display up to 6 items in the graph below. 4. Legend: This is a legend of the graphs that are currently displayed in the graph below. The colored boxes correspond to the color of the graph. Left-click on the item to highlight it in the graph below. Right-click on it to remove it from the current set of graphs. 5. Graph Sets: Click the green arrows to select the graph set to view. See the section "Graph Sets" below for more information. 6. Time to View: Click the green arrows the change the time of the graph. There are five options: Entire Time, 6 Months, 1 Year, 3 Years, and 5 Years. Entire Time displays the selected graphs over the entire time you. ve played the game. The other options show the graph over the past 6 months, 1 year, 3 years, or 5 years. 7. Close button: Closes the current screen and returns you to the main menu. 8. Toggle Main Menu: Opens the main menu without closing the current screen. If the main menu is already shown, clicking this button will hide the main menu. 9. Add Graph Set: Adds a new graph set based on the currently selected graphs. You cannot have more than 10 graph sets. See the section "Graph Sets" below for more information. 10. Remove Graph Set: Removes the currently selected graph set. See the section "Graph Sets" below for more information. 11. Clear All: Removes all of the currently selected items from the graph at the bottom. 12. Magnify: Enlarges the graph at the bottom to fill the entire screen. See the section "Full Screen Graph" below for more information. 13. Graph: The graph that displays all of the currently selected items. You can select the items to display in the graph by selecting items from the various categories. The legend shows which color corresponds to which item. 1. Close / Shrink button: The Shrink button (which looks similar to the Magnify button) brings the graph down to normal size after you have enlarged it. 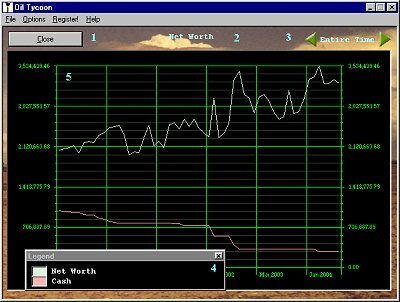 When a graph set is displayed automatically at the start of a turn, the Shrink button is replaced by the Close button, which closes the Graph Sets screen. 2. Graph Set: (only shown on the graph set screen at the start of a turn) Displays the title of the current graph set, and if there is more than one graph set, presents green arrows which you can use to switch between them. Only graph sets you have specified will be available. See the section "Graph Sets" below for more information. 3. Time to View: Click the green arrows the change the time of the graph. There are five options: Entire Time, 6 Months, 1 Year, 3 Years, and 5 Years. Entire Time displays the selected graphs over the entire time you've played the game. The other options show the graph over the past 6 months, 1 year, 3 years, or 5 years. 5. Graph: The graph that displays all of the currently selected items. You can select the items to display in the graph by selecting items from the various categories. The legend shows which color corresponds to which item. You can groups several graphs together to form a graph set. Graph sets are a way to organize graphs into groups you use often. For example, a graph set may display the net worth vs. cash, oil received from importing vs. oil from wells, or comparisons between the selling prices of all the crude products. You can have up to 10 graph sets, each with 6 separate items. To create a new graph set, make sure you have "No Graph Set" selected, and select the items you would like to display in the graph set. Then, click the Add Graph Set button, type in a name, and click OK. You now have a new graph set! You can modify which items are displayed by selecting and deselecting them while the graph set is shown. Finally, you can remove a graph set while it is selected by clicking the Remove Graph Set button. Graph sets can also be made to display automatically at the start of every turn. You can view quick statistics on the selling price of refined goods, import / export prices of crude, etc. every time you start a new turn to keep updated on sudden jumps. To make a graph set that will appear at the start of every turn, create a new graph set with the "Show at the beginning of every turn" option selected. You can use and view the graph set as any other. Net Worth: Total net worth over time. Cash: Cash available over time. Crude in Stock: Levels of crude stored in your storage tanks. Storage Available: Available space in your storage tanks. Taxes: Taxes you have paid to the government. Import Price: Trend in the cost of imported crude. Export Price: Trend in the price of exported crude. Crude Imported: Amounts of crude that has been imported. Crude Exported: Amounts of crude that has been exported. Crude from Wells: Amounts of crude that has been received from wells. Reserves Remaining: Crude remaining in your land plots. Average Crude Cost: Average cost to receive crude oil. Demand for Crude: Trend in demand for crude in the overseas market (the maximum amount you can export each turn). Cost: Trend in the cost to refine selected product. Price: Trend in the selling price of the selected product. Amt. in Stock: Amount of the selected product available in storage. Amt. Refined: Amount of crude sent to the refineries to be refined into sellable products. Amt. Sold: Amount of the selected product sold. Breakeven: The breakeven price for profit of the selected product. Lubricants Refined: Amount of crude refined into lubricants. Gasoline Refined: Amount of crude refined into gasoline. Fuel Oil Refined: Amount of crude refined into fuel oil. Oil Products Refined: Amount of crude refined into oil products. Kerosene Refined: Amount of crude refined into kerosene. Total Refined: Total amount of products refined. Max Refinable: Maximum amount of crude that can be refined in one turn. Refinery Price: Trend in the selling price of refineries. Refinery Cost: Trend in the cost of refineries. Storage Available: Amount of free space in storage. Storage Used: Amount of storage used. Storage Rented: Amount of storage rented to store an overabundance of crude and / or products. Storage Cost: Trend in the cost of storage units. Storage Price: Trend in the selling price of storage units. Crude from Wells: Amount of crude received from county. s wells. Reserves Remaining: Amount of crude in the county still available for drilling. Owned Plots: Number of plots owned in the county. Surveyed Plots: Number of plots surveyed in the county. Available Plots: Number of plots not purchased or sold in the county. Sold Plots: Number of plots sold in the county. Total Depletion Rate: Total rate at which all wells are drilling oil from the county. Land Value: Total value of all the land in the county. Wells: Number of wells drilled in the county. Credit Rating: Your credit rating over time. Values of 6 indicate an "AAA" rating, while values of 1 are "D" ratings. Total Number of Loans: Total number of loans taken from the bank. Total Loan Balance: Total amount of money you owe the bank in loans. Interest Rate: Interest rate over time.